I’ve really been on a taco kick lately. Matt and I don’t love spicy food which is great because we like about the same amount of spice on most things. When I was dating Matt I was relieved to find that he liked the same amount of spice as I do. These tacos were awesome, they have a little more spice than we usually like but it was so good! 1. Heat oil in medium skillet over medium heat until hot and simmering. Add the onions and garlic and cook until softened, about 4 minutes. 2. Add the spices and a 1/2 teaspoon of salt and pepper, cook, stirring constantly, until fragrant, about a minute. Add ground beef and cook breaking up the meat with a wooden spoon and scraping the bottom to prevent scorching. 3. Add tomato sauce, chicken broth, brown sugar, and vinegar, bring to a simmer, uncovered, stirring frequently and breaking meat up so that no chunks remain until liquid has reduced and thickened. It should take about 10 to 20 minutes. Add salt and pepper to taste. 4. We fried our own corn tortillas, you can buy the store bought ones. These were so much better! Using tongs shape them as best as you can by frying one side at a time and flipping and frying the other side. Oh yum! These sounds fantastic. Thank you for posting this recipe. I hadn't thought about frying the taco shells before. I can't wait to try it. Now I am craving tacos! Thanks for sharing on Creative K Kids Tasty Tuesdays. We love it when you ladies share with us. These sound fabulous!! Thanks for sharing with us on Thursday Favorite Things blog hop. Yum. I love these. 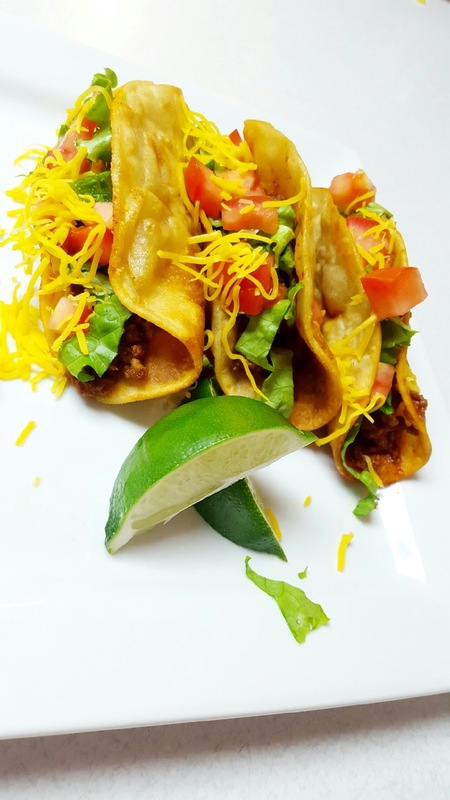 We make our tacos with corn tortillas but just lightly fry them to make them soft. I need to try this method. Thanks for linking up to Tips and Tricks. Hope to see you again this week. Pinned! 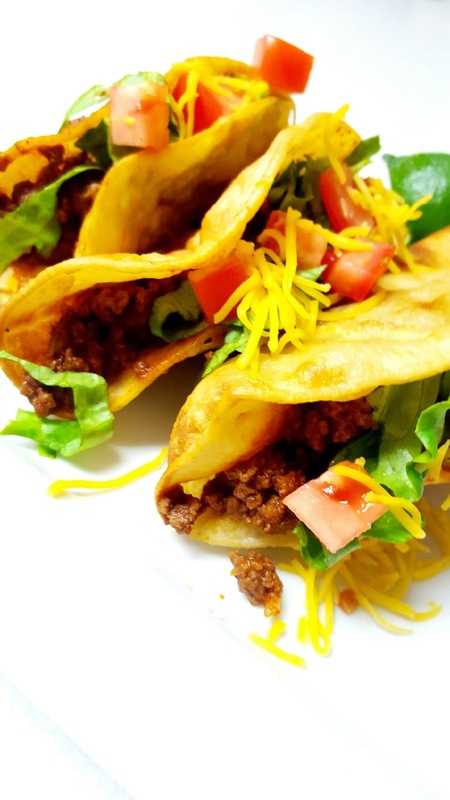 What a delicious recipe for tacos – love the spices you have used. Thank you for sharing with us at the Hearth and Soul Hop. Tacos are one of my go-to meals. These sound so good! Thanks for linking up with Merry Monday last week. 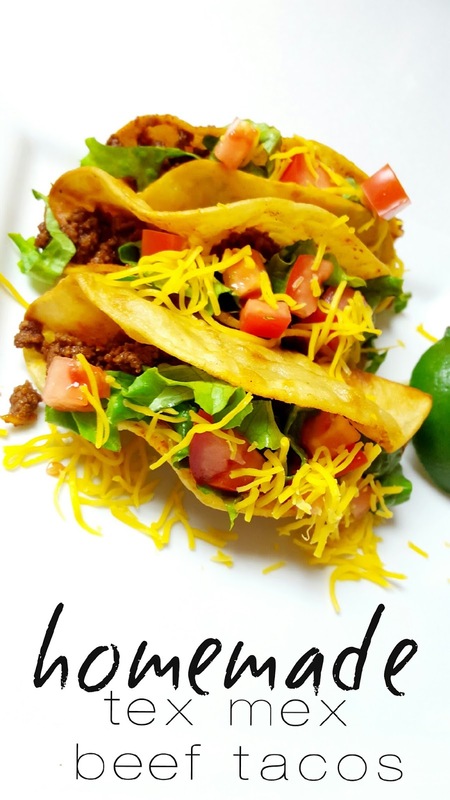 the tacos looks unbelievable delicious! I can even feel their flavor through your photos. These look delicious! Every day is a good day for tacos. These look amazing! Thanks for sharing at Home Sweet Home! Yummy! Looks delicious. Thank you for sharing at Funtastic Friday.